One of the most diverse high schools in the country, Mission has 925 students holding 47 different passports. The majority are Latino, African American, and Asian American, and 72 percent are poor. Yet even as the school was being placed on the list of lowest-performing schools, 84 percent of the graduating class went on to college, higher than the district average; this year, 88 percent were accepted. (Nationally, 32 percent of Latino and 38 percent of African American students go to college.) That same year, Mission improved Latinos’ test scores more than any other school in the district. And while suspensions are skyrocketing across the nation, they had gone down by 42 percent at Mission. [Principal Eric] Guthertz had seen dropout rates fall from 32 percent to 8 percent. Was this what a failing school looked like? There’s more to this story, and if you make it to the end you’ll see that the news isn’t all rosy. But the news isn’t terrible, either. We have plenty of failing schools, and we should be doing a lot more to figure out how to fix them. It’s a disgrace for a rich country like the United States to be failing so many of its kids. 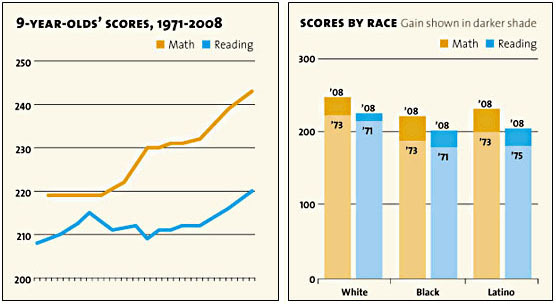 At the same time, taken as a whole, the American educational system isn’t in decline. That’s something you don’t hear very often because there are a lot of interest groups who are invested in a narrative of educational failure. But the data just doesn’t back them up.